Saturday’s abysmal collapse to Norwich was a bitter pill to swallow in a game that virtually ended our hopes of finishing fourth. Not because of the points difference – six is not an insurmountable figure to claw back – its more the fact we continue to not learn from our mistakes and repeatedly flounder against limited operatives at the foot of the table. The Toffee’s made just two changes from the Oldham draw with the ‘much maligned’ mono-paced Steven Naismith coming in for Victor Anichebe and Seamus Coleman replacing Phil Neville at right back. Norwich lined up with Becchio and Holt in the jforward berths, although ex Leeds schemer Robert Snodgrass was basically playing as a wide forward in the space vacated behind Baines. This was Norwich’s main attacking trick with Russell Martin >; Snodgrass their most frequent passing combination, occurring 16 times. 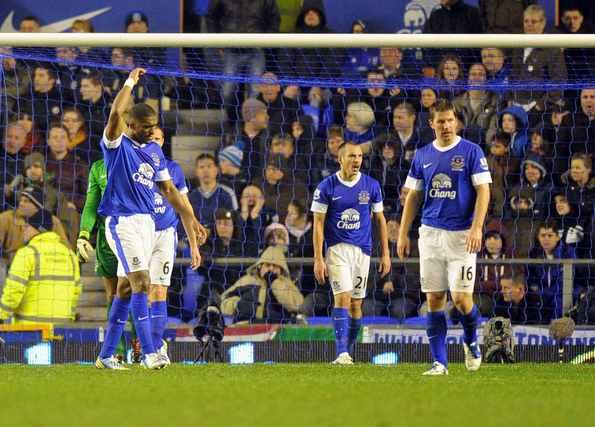 It had all started so well for the Toffees. Fellaini (circled) as he likes to do, comes across to the left flank to give us an extra man and draw in opposing defenders which creates space for Baines (arrow) to whizz up the flank and plant a sumptuous delivery on the head of Leon Osman for the game’s opening goal. Generally the Blues were on top thereafter but threatened very little against a side who haven’t been able to buy a win of late. Whilst we had more of the ball there was little end product, particularly in the second half when we created no chances from open play. The in-effective Naismith churned out another tepid display with Kevin Mirallas left on the bench for the bulk of a game where a second goal would have surely knocked the stuffing out of the home side. In a game the Toffee’s controlled for large spells, we had the bulk of possession (55.2%), had more territory (53.7%) and had more of the ball in the final third (132 v 76 completed passes). Norwich made more of their time on the ball considerably with 50% of their 10 shots hitting the target compared to 20% of our 15 efforts on goal. This game featured two of the most prominent crossing teams in the division and all 3 goals came from such situations. Whilst we are statistically conceding fewer chances from headers and set plays per game this season based on last, rather damningly we have conceded the most headed goals in the top flight. Norwich had 30 crosses to our 26, with a slightly better accuracy (16% v 15%). My usual gripe with Moyes is that we tend to invite crosses with our approach being to pack the box sufficiently enough to evade trouble when the ball lands in the danger areas. This tactic is stupid against sides who possess heavier aerial artillery than us like Norwich or Stoke for example and to be fair we did try and stop the crosses coming in, with 7 blocked crosses to Norwich’s 1, however our defending when the ball came in was utter crud. In the first goal, Fellaini has to take the blame for failing to get tight on Kamara and block his run off as the sub is able to get a run on the Belgian (circled). Fellaini has form for doing this in the last twelve months, most notably in the semi final surrender last season. On goal two, Coleman has tucked in which means Naismith goes into the right back spot and Gibson shuffles across to the Scot’s position to double up with him, which is fine. Osman however doesn’t shuffle into Gibson’s position meaning Martin (circled) has time to take a touch and spin in a delivery. When the cross comes in Distin is the only player who attacks the ball, compared to Norwich’s three at the back post (Holt, Kamara and Bassong) with the motionless Baines guilty of ball watching. The defensive line for Goal Two is also ridiculously too deep, just as it was for Norwich’s equaliser at Goodison earlier this season. This game was in many ways a microcosm of the themes which have held us back this season with our abundance of possession not translated into chances created, combined with us not being able to defend from set plays and conceding sloppy goals, predominantly late in games. In comparison to our closest rivals we haven’t been able to beat sides such as Reading, Norwich (twice) QPR and Wigan and thus don’t really deserve to be in the ‘shake up’ for the Champions League spots. Moyes has to take the bulk of the flack here for some overly cautious substitutions when the game was there to be won, combined with our continued failure to address problems with defending balls into our box. After becoming experts in how to concede first the Blues let a lead and much needed points slip for the second week running as Norwich came from behind to earn a point amidst an edgy atmosphere at L4….. The first half display was impressive with Baines and Oviedo showing some nice stuff down the left. 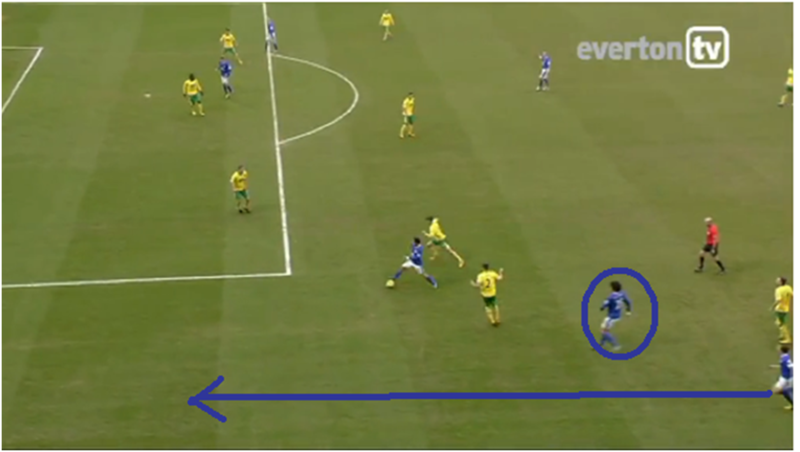 Oviedo was hugging the flank high up the pitch with Baines looking to go inside towards goal at all times. Our goal was an example of Oviedo providing good width, with Hitzlsperger playing a nice ball over the top for him to chase onto and deliver for Naismith to slot home. It was the Scotsman’s third strike in his last three starts. Naismith should really have sealed the game in the second half when he was put clear on goal only to deliver a Geoff Thomas style chip into the corner flag. 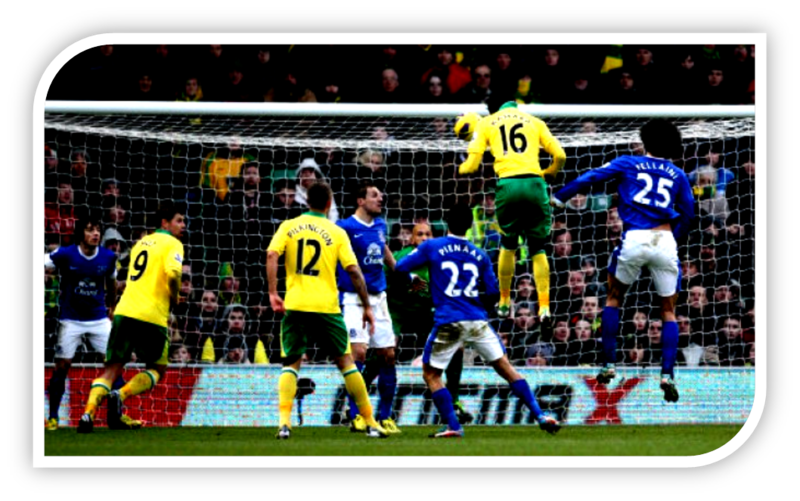 Baines was unlucky not to get a couple of goals with his dribbling a constant menace to Norwich. The wing back was visibly pissed off the more the game went on with the output of Jelavic in particular irking the lateral schemer; at one stage Baines angrily confronted the Croatian after he didn’t ‘show’ for a one two as Norwich began to get more of a foot hold on the game. In the second half Norwich came out more aggressively. As noted in the preview they are happy for you to have the ball and will sit deep and look to soak up pressure. Trailing by a goal, Hughton looked to press us further up the pitch andoff the ball as a team they were superb in terms of work rate. Last season we noted how they cover more distance than any side in the league and Tettey epitomised this spirit with six interceptions – the most of any player on the pitch. This presing made it more difficult for us to play out from the back and resulted in more panicky long balls as the half went on. The switch of Morrison for Hoolahan was a signal of intent of what was coming in terms of an aerial onslaught as the game headed to its closure and crowd anxiety reached boiling point. We had a look after the Reading game last week at the issue of conceding from set plays. We’ve now shipped seven goals from dead balls (corners/free kicks/pens) which is more than we conceded in the whole of last season. Our approach to defending dead ball deliveries is like most sides in the top flight; we will bring most /all players back and outnumber opponents which enables us to adopt a mixture of man and zonal marking. This was the same last season. Stopping dead ball situations arising needs to be priority one. Only Stoke (182) commit more fouls than ourselves (172) and whilst Pulis mob have six footers in all positions and specialise in defending such situations, we don’t have the artillery with a pint sized midfield and few big physical types. The situation was exasperated yesterday by the absence of our main aerial dominator Fellaini as Norwich won a stack more aerials than we did with Holt in particular dominant, winning 7 of his 9 headers. Baines was the games top performer on the ball however he was guilty of getting too tight to Morrison for the foul which led to the free kick Norwich equalised from albeit it looked like Morrison’s fall was as much down to him losing his footing. If you look at the starting point from the free kick we are too deep defensively. As an example, Barcelona’s recent game at Celtic pitted a side who were aerially strong against a Pique-less Barca who had no six footers in the side. Barca’s approach was to keep a very high defensive line when the ball comes in so when the ball is delivered over them it’s still going to be a fair distance away from the goal for a forward to attack. Or you get an off-side decision. The bulk of the issues we have faced in dead ball situations have been from players switching off and not showing the required focus / concentration for 90mins. Fellaini against McAuley and Coleman v Le Fondre last week spring to mind. 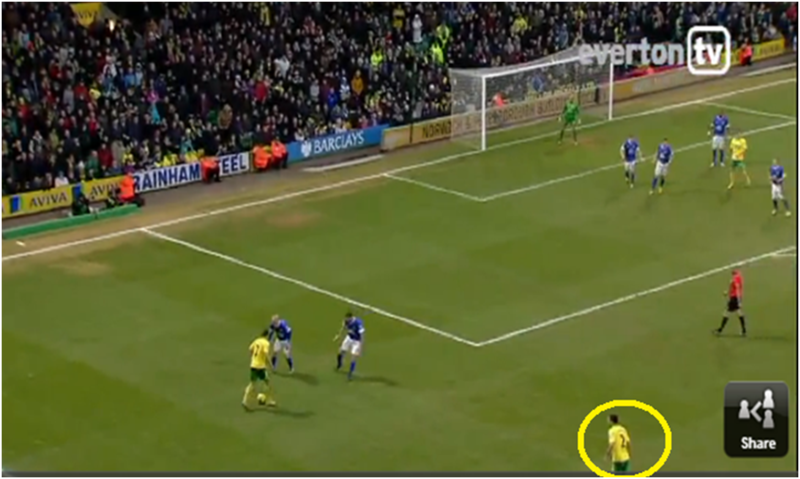 The warning signs where there in the first period when Bassong had a great chance, unmarked from a corner. 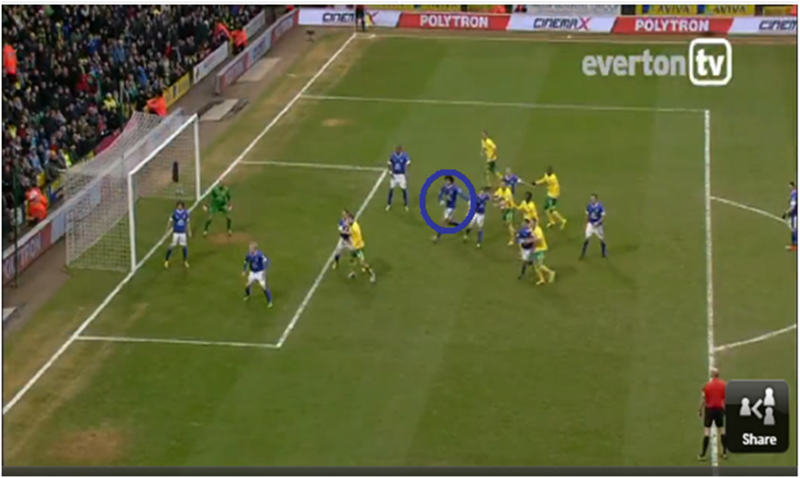 As the ball comes in Howard takes a step of his line, then retreats whilst Bassong goes behind Heitinga to head home. Both Howard and Heitinga were identified by Moyes post match as the chief culprits of Everton’s latest defensive disaster. Howard should have come even if its just to punch away whilst Heitinga hasn’t got a clue where Bassong is; the not so dynamic duo are a complete pair of biffs. You could be forgiven for thinking this match report was a copy and paste job from last week given the nature of the performance and dead ball woe. This was another disappointing result and one that leaves us flagging in the ‘chase’ for fourth with tricky fixtures coming up against Arsenal, Man City and Spurs. It’s easy to rue the loss of key personnel but ultimately we should have put Norwich away in the first half when we had the opportunities. Credit to the Canaries, they are limited on the ball but work very hard and this tactic upset our rhythm in the second period and got them a deserved point. Last season I recall only one point being accrued from home games against Bolton / Blackburn leading to a similar mood of despondency which was then followed by back to back wins against the league’s premium fat cats Man City and Chelsea. You wouldn’t put it past the Blues surprising us all over again. Saturday’s visit of Norwich will be seen by many as a ‘must win’ given the feeble collapse last week against the mighty Reading. This weekend’s preview will take a more in-depth look at Norwich’s key strengths and the areas of weakness we should look to exploit…..
Defensively they have been in resolute mood of later, only conceding once in their last five games in a run of matches which has seen impressive wins against the likes of Spurs, Arsenal and Man Utd. Hughton’s sides are never particularly easy on the eye with his signature approach being to churn out teams with a rigid backline that are hard to beat. After some initial hammerings, everyone now appears ‘on message’ with Hughton’s mantra. Like Reading last week they won’t be too concerned with not having the ball; their wins against Arsenal / Man Utd were achieved with an average share of the ball of just 35% and off the ball is where their key strengths reside in terms of organisation. Individually though they do have weaknesses; neither full back has a particular good turn of pace whilst Turner is susceptible to quick feet running at him. That said, they’re going to be a tough nut to crack and given our kamikaze defending of late you feel we will need to crack it at least twice to win the game. This game showcases the two sides who have successfully delivered the most crosses in the league and this will be Norwich’s principal attacking weapon. With 65 successful crosses we are the top dogs with Norwich (57) in second spot with their most frequent exponent of the centre the ex toffee target Robert Snodgrass. When defending sides that play this way it’s important to play higher up the pitch and not allow your opponent to get into decent 2v1 situations or good crossing angles in the final third. Coleman is having a terrible run at the moment and you get the feeling it’s going to get worse before it gets better for the whole hearted but distinctly limited Irishman. Last season his lack of lack of ability on the ball led to him being frozen out of the right sided midfield reckoning. This season’s confirmation that he can’t defend either has basically left him facing into the footballing abyss otherwise known as Paul McShane. He really needs to up his game and show he has more to offer than his impressive twice annual outing as Gareth Bale’s shadow. Back to the crossing and our high line should in theory mitigate the threat of Norwich’s delivery from wide areas but given our defensive omnishambles last week who knows. In attack, long armed farm-hand Grant Holt will lead the line but due to suspension will be denied an ‘elbow-off’ with Marouanne Fellaini – the duo are statistically the league’s most persistent foulers. Holt was touted in some quarters as an outside shot for the Euro’s squad in the summer and whilst this was never really likely if you afford him decent delivery he can do damage as he showed in both games last season. More interestingly is the fact that Holt had a spell with Sengkang Marine – now Hougang United Football Club – in Singapore’s S.League back in 2001. That’s Thursday’s boring fact #1. Norwich will line up in a 4-4-1-1 formation with ex toffee John Ruddy behind a back four of Javier Garrido/Steven Whittaker (fullbacks) and the aerially decent duo Sébastien Bassong (who once had a trial with us) and journeyman Michael Turner who turned out for Inter Milan as a youth ( #2) . Turner is rated at 50-50 so may miss out. In midfield, Bradley Johnson has been dribbled more times (36) than anyone in the top flight and also has the look of someone who probably can’t believe he’s earning a living out of football. He will occupy the centre mid slot alongside Tettey. On the flanks, Snodgrass and Pilkington will occupy right and left respectively with the majestic Wes Hoolahan the link man between midfield and Holt. The big call for us is who will replace Fellaini. If fit, Mirallas will get the nod and I’d have him running at Turner from the kick off. 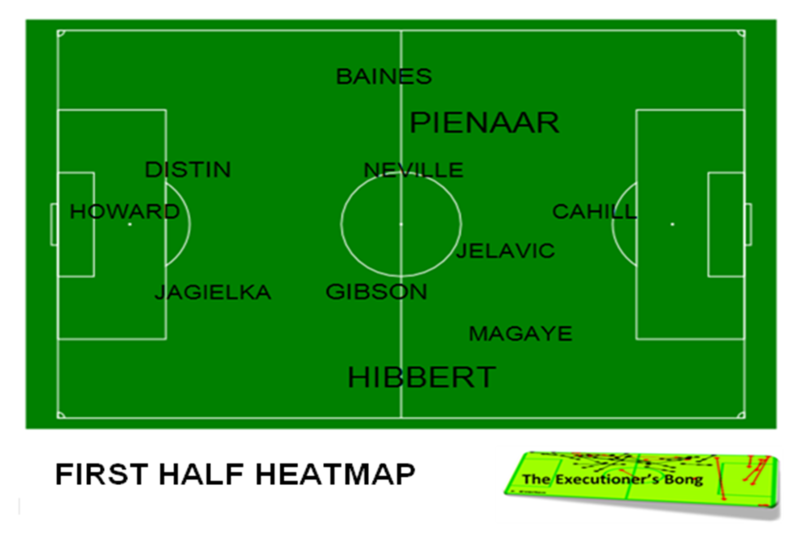 You could of course stick Pienaar up there with Mirallas on the left flank. If KM is injured, Osman could be moved forward IF Gibson is fit to start. That’s a big ‘if’ though. Young Ross Barkley of course is now back from his loan at Sheff Wed where he has predominantly operated in an orthodox centre mid slot and Moyes seems more sure of his credentials for a starting place centrally “Ross has done great. He is a young boy, 18, and those games in the Championship will bode well for us and for him”. Having watched him a few times, notably his able handling of the snide’s snide Michael Brown against Leeds I’d say he’s ready for this type of tussle. Given the way he was man-handled in the corresponding fixture last season I’d also be tempted to give Heitinga the day off to look after the ponies with Distin’s height at set plays a must given the loss of Fellaini and the fact Anichebe has fallen of the face of the planet. We are favourites for this one, offered at a best priced 10/21 with Pinnacle. The draw is offered at 11/3 with the same provider with an away win an offer at 7/1 with Betfred. It’s hard to recall our last clean sheet and we haven’t failed to score since the opening weeks of the season so both teams to score (best offered at 5/6 by Bet Victor) is the dead cert here, probably with us eeking out a 2-1 win. With Fellaini out, Osman could be used further forward and you always fancy him against sides from the middle to lower echelons of the table and he’d be my shout in the goal / win market. You can bag that at 9/2 with Ladbrokes. Both sides opened up in 4-4-1-1 systems with the Blues making 3 changes to last weeks win over WBA with Osman, Heitinga and Fellaini dropping out and Gueye, Neville and Distin coming in. Norwich started with Howson playing off Holt with wide support coming from Bennett on the right and Hoolahan on the left. The Blues began in the first half playing more down the right side than the left as the heatmaps show. The maps are based on average position and touches off the ball…as you can see Hibbert was our most prominent player in the opening 45mins however the fullback isn’t particularly comfortable on the ball which limits our options in the final third; his average pass completion was 59% yesterday which is poor at this level. As the maps show our more potent left sided Bainaar axis grew in prominence as the game went on and was again the source of our most incisive attacking work with both goals coming from the left side. One aspect of our play which wasn’t fluid yesterday was Howard’s kicking which was both poor and excessive. The American usually makes 11 long kick outs per game but made 31 yesterday, with an accuracy of just 22%. Granted, Holt and Howson played high up and worked hard to press angles but often the long kick was chosen when a shorter pass was available. Our new forward Nikica Jelavic now has four goals from just eight shots on target in the league and looks like another shrewd Moyes purchase. His first goal yesterday was from signature Bainaar movement down the left flank which released Jagielka in the box whose cross was deliciously flicked home by the Croatian. His ability to hold up the ball up makes him ideal for the role of the lone forward and he won 4 aerial duels yesterday which combined with his chest control enabled us to get midfielders forward and build attacks. 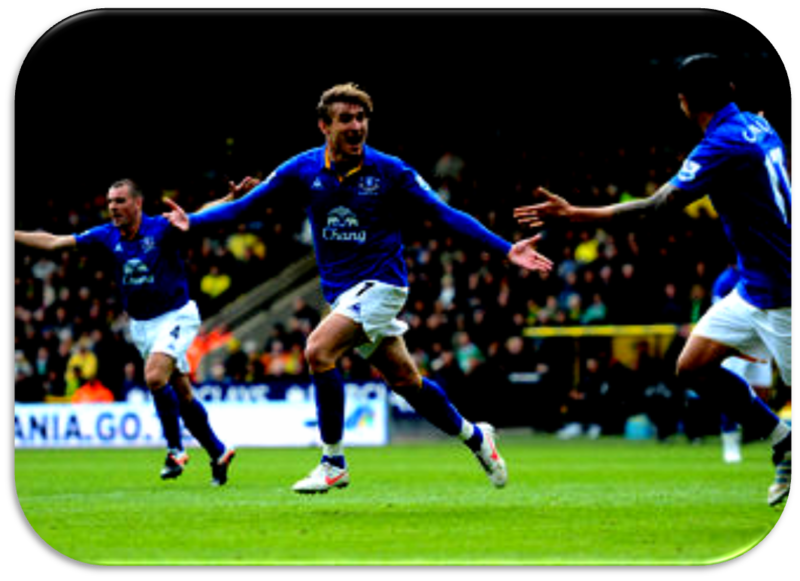 In total yesterday Jelavic had 3 shots, all 3 of which were on target and his second goal was another tidy finish after more good work from the tireless Pienaar. The South African weaved his way through the Norwich defence before teeing up Jelavic who again found space and finished effortlessly first time. We worked the ball more fluidly into the box than our hosts with 71% of our shots from inside Norwich’s 18 yard box compared to our hosts 43% in our area. The Croat provides a great target for the naturally unselfish Pienaar who yesterday provided 5 successful through balls, 4 of which went to Jelavic. Put in context, we average 1 successful through ball per game this season. Norwich were also looking to attack down the flanks and get balls in and around our box for their talisman Grant Holt .Whether you love or hate the big forward you couldn’t doubt his impact – yesterday he was the most fouled player on the pitch and also committed the most fouls and his knack of winning free kicks in and around opponent’s 18 yard boxes is a strength Norwich exploit to the max. After being second best in the first half Lambert decided to make changes when we went 2-1 up early in the second half. As noted in Friday’s preview, Lambert’s substitutions have won Norwich 10 extra points this season and he has arguably the fittest side in the top flight if you judge it by distance covered. Both factors were crucial to Norwich storming the last 30 minutes and leaving us quite happy to hear the final whistle. The crucial change was to abandon 4-4-1-1 and add an additional striker in Aaron Wilbraham and re-shape the midfield into a narrow diamond and play through the middle. 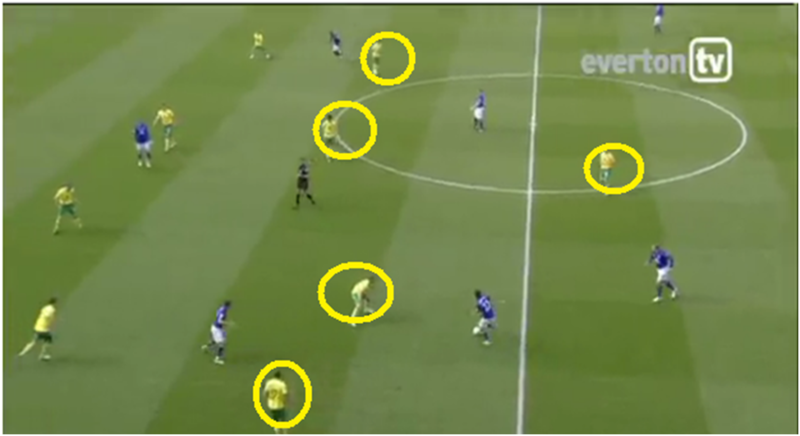 Above shows Norwich’s opening 4-4-1-1 shape with the 5 midfields circled as a flat 4 and then Howson in front. Lambert’s switch to a diamond enabled Hoolahan the space between our midfield and defensive lines (below) in the build up to Norwich’s second equaliser with Felli & Gibson (blue lines) quite flat shape wise. 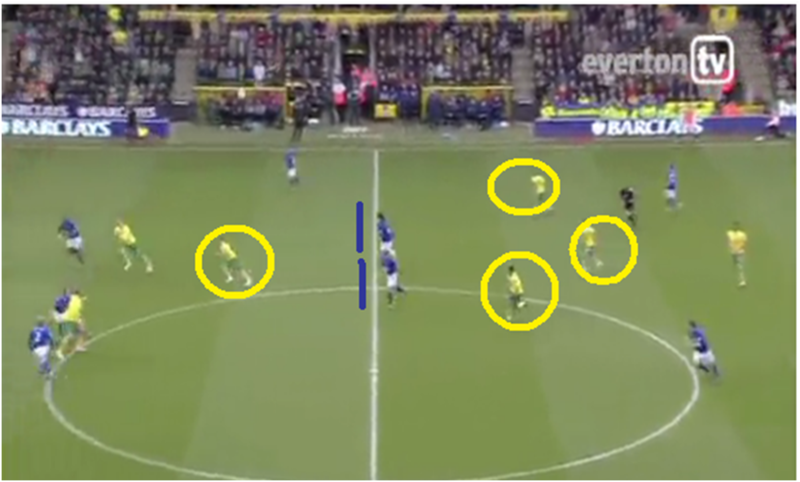 Lambert’s switch was to instigate more options going forward and to reign in Pienaar’s darts from the left into the hole between Norwich’s defensive and midfield lines. Howson moved back to anchor the diamond with Hoolahan at the sharp end behind the substitute Wilbraham who formed a strike duo with Holt. The move was to pay dividends as Hoolahan – who also assisted the first goal – had acres of space to play a nice through pass to Wilbraham whose shot was initially saved but when the ball broke free he managed to hold off Jags a bit too easily and find Holt who finished nicely. It should be noted that the goal came from a poor long kick out from Tim Howard. 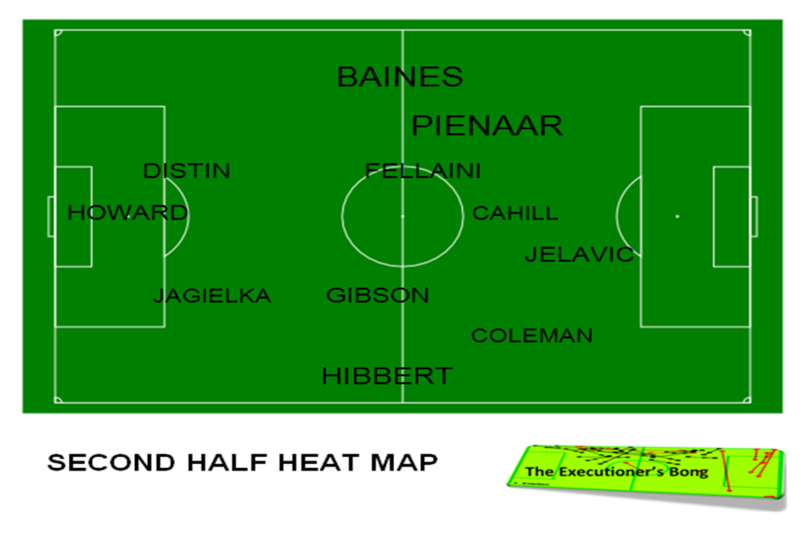 Moyes response was to bring on Anichebe for Cahill with the Nigerian moving out to the left wing with Pienaar moving inside to provide a compact midfield 3 with Gibson sitting a bit deeper to keep tabs on the dangerous Hoolahan. This was an entertaining draw and certainly a point gained rather than two lost against an impressive Norwich side. There were impressive displays from Pienaar and Jelavic in particular, whilst Gibson’s long range passing was again superb. Fair play to Lambert whose tactical change got Norwich back into the game in the second half when it looked like we were going to take the 3 points rather than 1. With no new injuries or suspensions incurred the only nagging issue is who takes up the only real space still up for grabs in the semi next week on the wing. Magaye’s display asked more questions than it provided answers and Coleman hasn’t really fired all season. Anichebe also featured on the flank and it could be the Nigerian’s extra physical presence that sees him start at Wembley next week.